I had planned a bus journey from Melbourne to Sydney, via Canberra. Canberra is Australian Capital Territory and has lots of good attractions worth visiting. If you book a Melbourne-Sydney ticket, Greyhound bus will stop at Canberra terminal for a while and then proceed. I figured out that if I split the tickets into two- Melbourne-Canberra and then Canberra-Sydney, then I can get some time to explore Canberra. So I booked my tickets such that bus from Melbourne would arrive in Canberra by 6 AM and my next bus to Sydney would be 11.30 AM- giving me about 5 hours to explore Canberra. I felt 5 hours is adequate-anything more would have left me with less time to explore Sydney. Once the plan is sorted, my next question was what to do with my bags- dragging it along all around the town was not practical- it would slow me down and won't let me explore much. Hiring a taxi or a hotel and keeping it there was other option, but that would have set me back by at least 50-100 dollars at the minimum. (Taxi option costs lot more than hotel). So I was looking for a locker room or storage facility where I can keep my bag for 5 hours, go out on foot, explore the city, come back, collect the bags and board bus to Sydney. We do not have a cloak room and any bag facility within our Terminal alone. As Canberra Terminal is located in Jolimont Centre you may want to see if there is a storage area for your bag. Google maybe the best way to see. Google wasn't much helpful. The folks handling Greyhound twitter account eventually confirmed there is a locker room available in Canberra [link]. But still I didn't know if the locker is big enough for my bags, how much it would cost and so on. 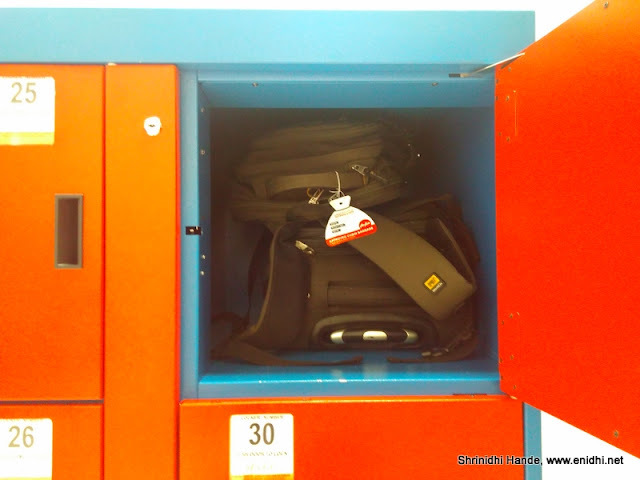 I went on with my trip and found out more about the lockers/bag storage facility in Canberra. I am drafting this post because I am sure there will be many other travelers who will be needing similar information while they transit through Australia's capital territory. Good news is that locker room is available in Canberra and it is affordable and practical. It is located right behind the Murrays counter in Jolimont Centre where coaches stop. So I didn't have to drag it along. Hotel Novotel Canberra is in same building. 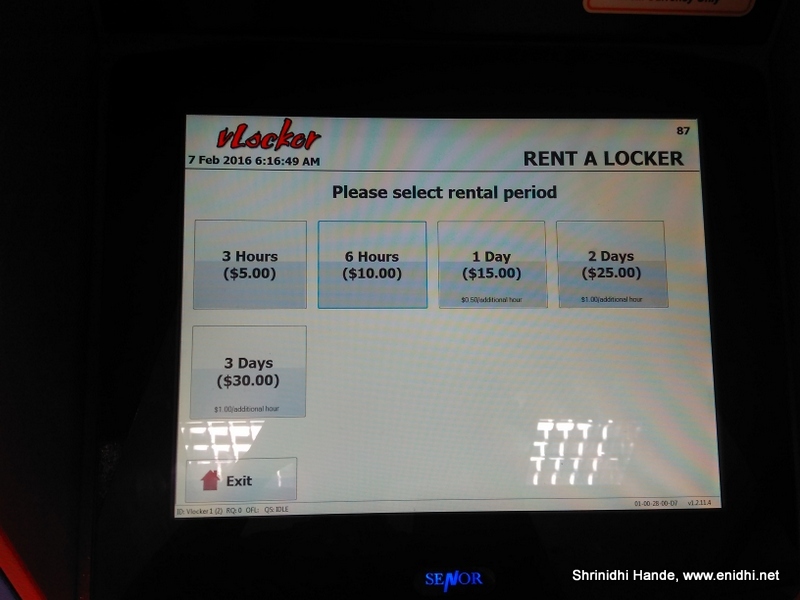 Rental fee/cost/amount for hiring lockers at Canberra Jolimont centre-Below are the fee for smaller locker, followed by fee for bigger one in next image. So how big are the lockers at Canberra? Fortunately, small size locker is big enough for a cabin bag. Large locker has same width and depth but double height. Most of cabin bags will fit in easily, but oversize check-in bags won't fit even in large lockers. You will have to rent a hotel/hostel room starting 60 AUD or so in that case. What else I should remember? One good thing I noted is that once you hire the locker, you can lock and unlock it multiple times within your rental duration. Some rental facilities I have seen operate on a per lock basis- once you unlock, it will be counted as fresh rental and you need to pay again. But the Jolimont centre storage facility lets you unlock and lock multiple times. Cloak room facility seemed to be owned and operated by Greyhound- I saw Greyhound stickers on the doors- very surprised their customer care couldn't confirm this. The facility is well automated. Your date of birth and a colour you need to chose during payment becomes the key to unlock your locker. 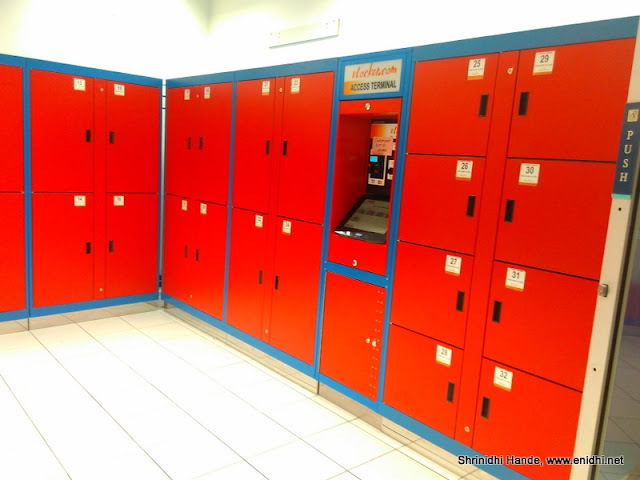 Availability of lockers can't be guaranteed, so do have a backup plan. Locker payment machine will not return any change. So be sure NOT to put excess amount. Overall, for 10 dollars I could keep my bigger bags for about 5 hours in Canberra and explore the town with more comfort. I am thankful to this facility and hopefully this post will assist others looking for similar service. Facility seem to be operational 24x7. But if you have late night plans, do check once with Greyhound. Disclaimer: All information as experienced by me on Feb 7th, 2016. Rental rates and other terms are subject to change over time. A very useful facility for travelers. Having a storage facility at bus terminals provide convenience to travellers who might have a change of plan at the very last minute due to unforeseen circumstances. They do not have to drag their entire stash of belongings which definitely requires a lot of additional time and effort. I agree....its a great facility for travellers. Afterall there are so many precious things which we carry while travelling and its risky to carry them. So by providing lockers to travellers, they can keep safe their valuable items in the lockers. Many thanks for this. Will the larger lockers fit a 20kg size suitcase? larger lockers have more height but width and depth is the same.. As long as your bag is having width of a cabin bag, it should be fine..
Thx Shrinidhi. Great job on the info! You're welcome. Glad it was useful. many thanks. was having a hard time finding out the info. Most standard size suitcases would fit into a large storage when inserted in upright position. if your bag is extra large/wide it won't fit. Unfortunately I don't have exact dimensions of the storage but you can get an idea from the image. The left luggage arrangements are slightly diff now. Luggage are to be left in the room under lock n key and arranged with the Greyhound counter staff / call 62118545. Only half-day and full-day storage till 6pm are avail, no overnight or multi-day.